Designing your own cycling T shirt or jersey is not that hard. 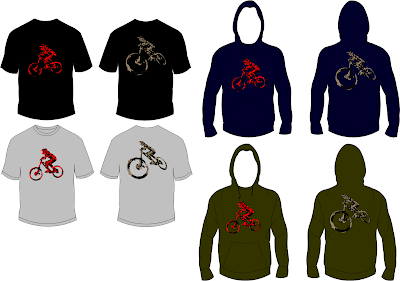 Check out a previous article where you can learn how to design your mountain bike T shirt using computer graphics software like Inkscape, Microsoft Visio and Vector Magic. Download this design for yhe back of your MTB bike T shirt in vector format (SVG) here, EPS format here or click on the image for a mountain bike hoodie. Wear your helmet while riding! Hi Josh! Thanks for reaching out.